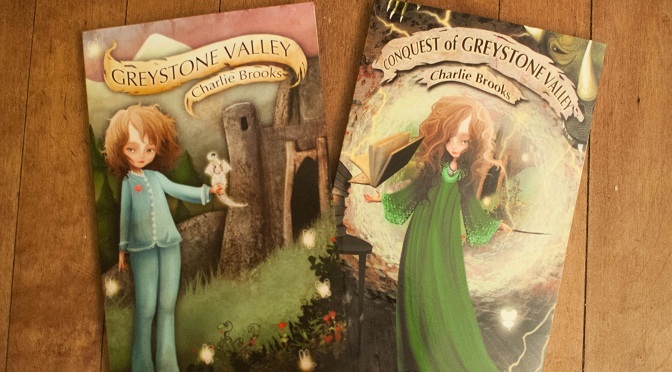 Today is your last day to preorder Conquest of Greystone Valley and get in on the Great Greystone Valley Giveaway! That means we’re on our last preview, so it’s time for something longer. When Greystone Valley came out, I posted the first chapter as a final preview. Well, this is the second book, so this time I’m going to post the second chapter. Sarah’s back and joined by her friend Carrie, but she’s also joined by her old friends Kay and Dax – who have somehow stumbled into our world. What are they doing here and why doesn’t Sarah remember them? Check out Conquest of Greystone Valley for the full story! The secretary in the reception area just rolled her eyes. Even though the school year was less than a month old, Sarah had already figured out one important fact: she could talk about magic as much as she wanted without anybody taking her seriously. As far as the adults were concerned, she was just a kid with an overactive imagination—and complaints about that were something her mom could deal with during parent-teacher conferences. Carrie blinked her hazel eyes rapidly. Sarah had come to expect the reaction whenever her best friend had to remind herself that she hung out with a secret enchantress. Carrie had long blonde hair and a smile that was guaranteed to make her popular with the boys when she got into high school. Sarah was pretty enough too, but boys didn’t usually make her want to do anything more than throw a punch. This had given her a bit of a reputation as a troublemaker, but luckily, high school was on its way. As long as Sarah managed to survive this year, she would go to a new school with new challenges—and leave these trips to the principal’s office behind. A door opened, but not the door to the principal’s office. Through the entrance that led back to the rest of the school stepped a figure that looked like it belonged in a field scaring away crows. He wore a wrinkled suit that seemed about two sizes too big for him and matched the many gray hairs in his beard. His disheveled hair looked like faded straw that had started to grow mold. Bloodshot eyes and a wrinkled face completed his grim visage. It was Mr. Daxon, the guidance counselor. Sarah, like most students at her school, recognized him immediately—not because she had ever spoken to him, but because of the wild rumors that flew about when her fellow students tried to guess why he looked so gloomy all the time. Her favorite theory was that a judge had sentenced him to work in the school as some weird sort of community service. Mr. Daxon was still new, but so far, all he had accomplished was to make sure the students got any guidance they needed from someone else. The dreary old man glanced at Sarah and Carrie, then grunted. He stepped in front of the secretary’s desk and cleared his throat. “Ms. Walker, one of these students has a meeting with me.” Mr. Daxon’s voice sounded like a violin that was badly out of tune. A moment of silence settled over the room after Sarah’s outburst. Carrie looked sick. Mr. Daxon had grown pale, as though he were negotiating with a large bear. “A-herm-herm-harrum.” Mr. Daxon cleared his throat for the third time since he’d brought Sarah into his office. She sat in a comfortable padded chair opposite his desk while he focused his attention on a computer screen in front of him—probably checking her permanent record or something. “Ahem.” He cleared his throat one last time. Then he gave his keyboard an experimental poke, as though he were poking the body of a dead animal. It didn’t seem to do anything, but he finally turned toward an increasingly impatient Sarah. “Ah! Yes! Sarah, I wanted to discuss your future.” Mr. Daxon folded his hands together and nodded as though he had just said something very impressive. They stared awkwardly at each other for a moment that seemed to drag out forever. Did Mr. Daxon know the truth? And if he did, what would her mom say? As the silence grew more tense, Mr. Daxon moved his hand to cover his mouth as though he were about to clear his throat again. “On to what?” Sarah asked, more perplexed than ever before. Sarah furrowed her brow. She had that feeling again—something tugging at the back of her brain, like a dream she’d forgotten. Who was Kay? She got an image of a tall, spindly boy not much older than her, holding a wooden staff and a book . . .
Sarah sat still for a moment, but Mr. Daxon seemed intent on not looking at her. Finally, she got up, left the room, and went back to class. She had to give the guidance counselor one thing: if getting into another fight meant more visits to his office, she wasn’t going to make a fist ever again. “No, I didn’t tell on you,” Carrie said as they walked to Sarah’s house following the bizarre school day. “But . . .” she shook her head and trailed off. “Never mind,” Carrie said, her face folding into a deep frown. “Well, how do you think I feel?” Carrie’s shout carried through the cool autumn air and stopped Sarah in her tracks. Carrie kicked a rock down the street. It skittered to a stop well before reaching anybody. The closest person on the road, an old man in a black coat, was so far away that Sarah couldn’t see his face clearly from there. “You don’t really think—” Sarah began. Carrie started walking again. Sarah followed alongside her, but her mind took a brief trip into the past. She and Carrie had met in kindergarten, when Carrie was this poor, unkempt, wild thing whose parents couldn’t afford her new clothes. The other kids teased her, but Sarah, who was a different kind of wild thing, played with her. That first meeting, she supposed, had colored their relationship in Sarah’s mind. Looking at her friend now, Carrie wasn’t that dirty-faced, tangle-haired, shy girl she used to be. She saved her allowance to buy herself outfits now. She did her hair carefully every morning. On some days, she even wore makeup to impress the boys. If she had changed that much, where did that leave them as friends? “Where are we going?” Sarah asked. “To your house, I hope.” Carrie’s frown disappeared, and she gave an unconvincing laugh. But whatever was bothering her hadn’t gone away—it was just hidden inside for the time being. “That’s all a matter of opinion,” Sarah responded. Carrie was acting like they were telling ghost stories at a sleepover. Sarah wanted to kick her in the shins. The words choked in Sarah’s throat. A second ago, they were walking home in bright daylight, but in the blink of an eye, the light went dim as though the sun had already set. A shiver ran through her and her body tensed. Then a pair of small men popped up out of nowhere, and Sarah knew she wasn’t the only person in the area who knew about magic. The two figures looked almost identical. They had chalky skin and pale blue eyes that looked almost ghostly white. They both had greasy black hair and grimy skin. Each had a long, narrow nose that almost resembled a bird’s beak, and their hands had jagged, claw-like nails. “Carrie, duck!” Sarah didn’t give them a chance to say anything. After everything else she had been through today, the ability to cut loose and blast a clear danger was something she welcomed. Unfortunately, Carrie wasn’t exactly adept at magical battles. A few real magic words from Sarah brought a hurricane-level gust of wind, but Carrie didn’t get out of the way in time. She fell headlong, colliding with one of the dark-clad men. The other attacker didn’t stand idly waiting for another magical attack. He pulled a blade out of his jacket that was almost two feet long and had several nicks and scratches along the blade that suggested it had been used recently. Sarah froze as she looked at the cruel weapon. She could certainly think of a spell to help her. If the other man had a similar sword, though, she wasn’t sure she could stop both of them before one of them hurt Carrie. Sarah jumped not because of the noise, but rather because of the unexpected presence of the person making it. The old man in the distance had caught up to them—and he wasn’t a random stranger like she had thought. Mr. Daxon’s shoulders were hunched and he wore a long black trench coat that was as wrinkled and disheveled as his work suit. Neither man responded with words, but the one who had been knocked off balance by Carrie’s flying form drew a sword of his own, leaving no doubt as to what he intended. The guidance counselor reached inside his coat, and Sarah’s eyes bugged out a moment later. Crazy old Mr. Daxon drew a broadsword that looked like it had been perfectly polished for just this moment. Everything that happened afterward seemed to be a blur. The man closest to Carrie grabbed her by the arm, but she twisted away, barely getting free before her attacker could get a better grip. In a split second, Mr. Daxon was upon the silent swordsmen, his own blade moving so quickly that Sarah could barely follow it. He sliced near one attacker’s hands, hitting his wrist with the flat of his blade and causing him to drop his weapon. The other gave up trying to grab Carrie and stabbed at the old man’s unprotected flank, but Mr. Daxon shifted and kicked out, catching the assailant in the stomach with the heel of his boot. The silent man finally made a noise, a loud groan as all the air in his lungs came out at once. Sarah’s head swam as she tried to figure out what to do next. She had so many different spells to choose from that she couldn’t decide. She had imagined this situation a thousand times, but now that she found herself in it . . .
“Fire!” The call came from Carrie, who dashed away from Sarah so one attacker couldn’t be near both of them at the same time. She waved her stick with a trembling hand as one of the men gave up on Mr. Daxon and went after her with his claws outstretched. It took Sarah a split second to realize what Carrie was saying. Then her head cleared, and she responded. Carrie waved her stick one more time as though she were trying to shoo the man away, but she closed her eyes in fright as she did so. Just as the attacker was about to grab her, Sarah’s spell flared to life. The man’s clothes burst into flame, forcing him to drop onto the ground and try to smother the fire. The victory was shorter lived that Sarah hoped. Overwhelmed by the skill behind Mr. Daxon’s attacks, the other man dashed backward until he reached Carrie’s trembling form. Sarah’s friend opened her eyes just as a clawed hand dug into her shoulder and a blade pressed against her throat. Carrie, caught in a panic, didn’t react quickly enough to twist away this time. Mr. Daxon slowly lowered his sword. Sarah, on the other hand, searched her mind and came up with a spell that could turn the tide of the battle in their favor. Just as she was about to shout out the magic words, though, the man holding Carrie waved his free hand, summoning up a smoky black darkness that enveloped all five of them. Mr. Daxon yelled and lunged forward, swinging wildly and striking not with the flat of the blade as he had done up until now but with the edge. He would have cut anybody to ribbons had there been somebody there. But both of the attackers had disappeared in the darkness—and Carrie had vanished with them. As full daylight returned to the area, Sarah looked frantically for her missing friend but found nothing. Only she and Mr. Daxon remained. “What just happened?” she asked the sword-wielding guidance counselor. Mr. Daxon tucked his sword back into its sheath in his coat. As he did so, all the energy seemed to leave him. His shoulders slumped, the wrinkles on his face became more pronounced, and he looked as if he had just aged ten years in a few seconds. His eyes scanned about for some hint as to where the kidnappers had vanished, but all he saw was the small blade one of them had dropped. He picked it up, placed it with his own weapon inside his coat, then turned to Sarah.